It’s something that comes up again and again: Your business has a blog, and a team of people responsible for the strategy, content creation, execution, and overall success of that blog. The team of people is actually one or two people partially allocated to the blog. The blog is one in a series of projects that the team of people are responsible for managing day-in and day-out. They are the creatives behind the blog. They have to execute. They also develop strategy. In this Blog Rescue, we want to look at a challenge that’s behind many, many business blogs: the challenge of limited resources and the need to get employees beyond the marketing team to contribute. 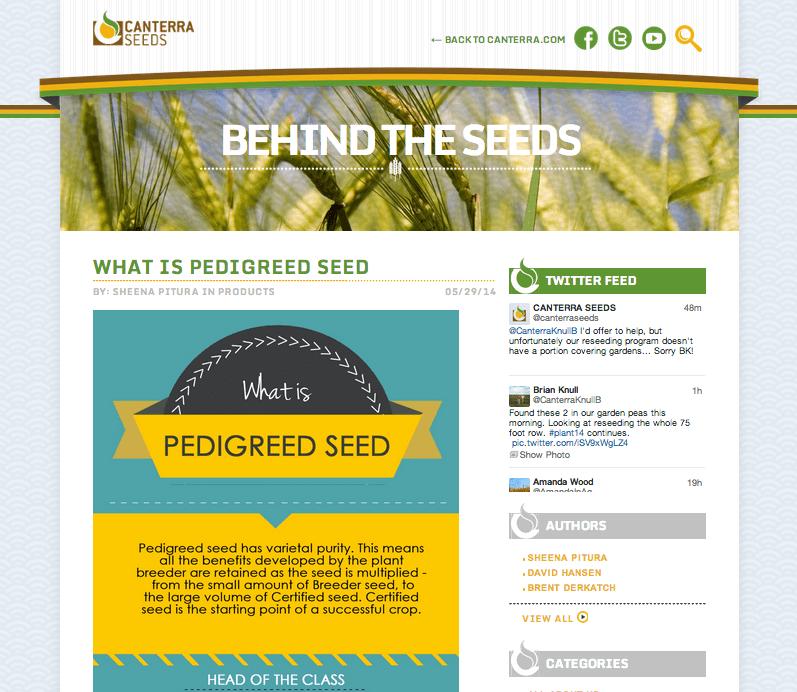 To help us do this, we selected the blog, Behind the Seeds, from Canadian seed company Canterra Seeds. Sheena Pitura, director of marketing tells us that in addition to increasing visits to the blog and interaction with the blog, another core issue is getting staff to contribute content. According to Sheena, one of the goals for Behind the Seeds is to develop a ‘human’ image for the company and to establish Canterra as a voice or authority on seed in the market. What better way to do this than through the employees of Canterra? They are the experts. They have the experience, which gives them authority. Sheena knows this. The challenge is to getting employees to contribute that expertise through content. Try as we might to know our businesses and industries, our expertise is in marketing. Our expertise is in communications. We are writers and storytellers. We can summarize the key points and make great brochures or plan an event that conveys a particular message or idea. But we need experts, and the experts need us. Blog Rescue isn’t a series on company culture, but let’s address it for just a moment. Employees’ enthusiasm or interest in blogging is influenced by the way the leaders at the company perceive the blog. Is the blog considered something that only the marketing team does? Is the blog the responsibility of an intern or entry-level “go-getter”? Or is it perceived as a tool that defines the company to the outside world—to the world of potential customers and seed enthusiasts? Is it touted internally as a place where employees’ expertise is put on display? The way the blog is positioned to a company’s employees will influence employee perception and willingness to contribute to the blog. I (Megan) recall a time early in my career when I was tasked with creating an employee e-newsletter. My boss had big hopes for it. She wanted it to be a tool that inspired camaraderie among our department, that conveyed a sense of “team.” I was a young super go-getter, someone who is considered exhausting by most, and I was overly confident that I would succeed. At first, I was able to get participation from many of my colleagues, but then directors in our department started to question the value of the newsletter. Once that happened, we were toast. Colleagues started to question whether or not they should contribute to the newsletter, and without their contributions our content was at greater risk of being lame. My colleagues were asking a similar variation of the same question: Is this e-newsletter a priority, and if I contribute will it make me look good in the eyes of my boss? Any time the answer to that question is “no,” even the super-est of go-getters are faced with defeat. A communications tool can’t change company culture (not without people trying to change culture); it is only a reflection of it. Consider Nuts about Southwest, the Southwest Airlines blog that features employees telling stories from every nook and cranny of the airline’s business. With an audience of 1.3 million, the stakes are high. They are impressively high. These stakes are something you, as an employee, want to be part of. What’s most telling about this blog is that the posts are all different. The voice varies. The novice storyteller posts the day after the experienced storyteller. That content is visible together, side-by-side. This blog achieves that desired “human voice” because it is authentic. The editorial team doesn’t polish everything human out of the blog. Another great example is HubSpot. HubSpot allows all of its employees to contribute to its company blog. In turn, they’ve blown it out of the water. Not to mention, they are ranked as a top place to work in Massachusetts. In fact, they have some great tips on how to cultivate a culture of content at a company. If you are thinking those examples don’t apply to your situation because they represent big companies—companies with more resources than you have—stop. Another example is this blog. Jay and Jess encourage our participation, and we are a mighty group of eight. They don’t overly polish what we say, and they love our ideas. Creating content to our blog feels like a contribution. It’s more than a post. It’s something that (hopefully) helps our readers, our company and our team. It’s a contribution that has value for Zontee and I. It gives us visibility and recognition. That makes the task a privilege, not a chore. Employees may be nervous about writing blog posts for a number of different reasons (e.g. not enough time, inexperienced at writing this type of content, unsure about topics). Be sure to address these barriers. For instance, if time is a major concern, make sure to have conversations with management and as a team indicating that the blog is a major effort across the company and that some time should be spent participating in its support. Sometimes a champion within management can make a big difference in rallying the masses. When I (Zontee) was at Lion Brand, senior vice president Jack Blumenthal was an advocate for the blog, sharing stories of his experiences on the road with our consumers and encouraging staff to do the same. If your staff is less experienced at writing blog posts, provide them with examples of different formats and styles. Give them some guidance. Perhaps your research lead can take a frequently asked customer question and respond to it. Or maybe someone who is in the field can share three lessons about your industry that they’ve learned from their travels. Even the humble “listicle” might find a role in your repertoire—especially for time-crunched staff members. Don’t forget to let them know that there will be someone to serve as an editor, to throw around ideas with them and “make them sound great.” For many people, this reassurance can go a long way. No matter how large or small your company, a blog can be a powerful tool within your content portfolio, one that is vastly improved by engaging your employees as contributors. The keys to building participation is (a) recognizing their vital contributions as experts, (b) integrating the blog within the company’s culture, and (c) addressing barriers to entry. What About Visits & Interactions? Be sure to check out our previous Blog Rescue, in which we talk about the importance of creating value for your audience and developing a promotion ecosystem for your blog. In addition to the tips in that blog post, consider making social sharing easier for your readers with apps like AddThis or Flare. Find out more about the importance of social integration, clear calls-to-action, and more in this Blog Rescue from earlier this year. On a related note, our fearless leader Jay Baer wrote a great post about increasing share of voice that has more fantastic engagement tips. Your main goal or two.